With gender disparity a topic at the forefront of modern discourse, leading technology career platform Honeypot, has released the 2018 Women in Tech Index. •	The United States offers the highest wages to women working in tech, at £61,492 per annum, followed by Ireland (£42,996) and Switzerland (£41,911). •	At 30%, Bulgaria has the highest percentage of women working in tech, followed by Australia with 28% and Romania at 26%. The results offer a view on gender-based employment inequalities both at large and in the technology sector. In an effort to position themselves as industry experts, the developer-focused career platform decided to research the role that gender parity plays in the technology landscape by comparing the proportion of female employees, gender wage gap and opportunities for women in the IT field, among other criteria. In sharing the results of this study, Honeypot aims to highlight which countries offer the best opportunities for women in tech and to encourage the industry at large to take further positive steps towards gender parity. •	Gender in the Overall Economy: factors such as percentage of women in work and the overall gender income parity. •	Women in Tech: as measured by the number of women in IT positions compared to the overall numbers of people in tech. 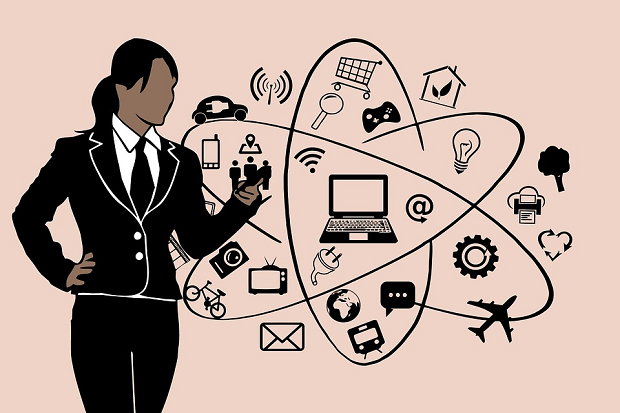 •	Opportunities for Women in Tech: calculated by comparing the difference between the percentage share of women in the general workforce, and the percentage of women in the technology sector. In addition, the study took into account the percentage of female STEM graduates. •	Tech Wage Gap: difference in gender wage gap between women working in the tech industry and the overall workforce at large. •	Female Career Progression: as judged by the percentage of women in managerial and ministerial positions. •	The United States has the highest number of women in the labour force, with 74.43 million. Malta has the least number of women in their workforce, at 80,000. •	Lithuania has the highest percentage of female workforce, at 51.17%, one of only two (alongside Latvia at 50.25%) countries in the index that have a higher percentage of women than men in their workforce. Turkey has the smallest percentage of female workforce, at 31.55%. •	Latvia has the highest percentage of women legislators, senior officials and managers at 44.4%, while South Korea has the least with 10.7%. •	Sweden has the highest percentage of women in parliament positions, at 44.5%, while Japan has the least, at 9.9%. •	Finland has the highest percentage of women in ministerial positions at 62.5%. Notably, France is the only country with 50% of its ministerial cabinet made up of women. Hungary and the Slovak Republic both have zero women in ministerial positions. •	Luxembourg has the highest overall wage for women, at £42,026 per annum. Bulgaria has the lowest, at £8,717. 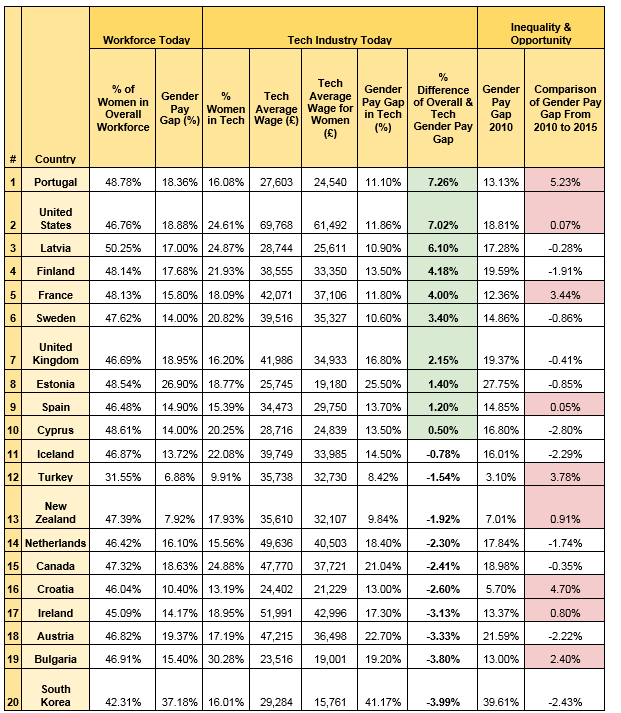 •	The overall gender pay gap is largest in South Korea, at 37.18% and joint lowest in Italy and Luxembourg, at 5.5%. •	The United States has the most employees working in the tech industry, around 6 million, while Malta and Iceland have the least, at around 7,000. •	6.04% of Finland’s labour force is in the technology industry, the highest in the index. 0.8% of Turkey’s labour force works in tech, the lowest in the index. •	The United States has the most women working in the tech industry, at just under 1.5 million. Malta has the least, with 800 women working in tech. •	Bulgaria has the highest percentage of women working in tech, at 30.28%. The Slovak Republic has the smallest percentage of women working in tech, at 9.29%. •	Israel has the largest difference between the percentage of overall women working, and the percentage of women working in tech, at -36.6%. Romania has the smallest difference, at -16.57%. •	Turkey has the highest percentage of female STEM graduates, at 37.11%, while Japan has the least, at 15.25%. •	The United States offers the highest wage both overall in tech and for women in tech, at £69,768 and £61,492 respectively. Mexico offers the lowest wages in tech, both overall and for women, at £13,839 and £10,974 respectively. •	Turkey has the lowest gender pay gap in the tech industry, at 8.42%. South Korea has the highest, at 41.17%. •	Portugal has the highest positive difference in percentage of tech pay gap as compared to overall wage gap, at 7.26%. Poland has the highest negative difference in percentage of tech pay gap as compared to overall wage gap, at -17.8%. •	Switzerland has the best Gender Inequality Score, at 0.04, while Mexico has the worst, at 0.345. •	South Korea had the highest overall gender pay gap in 2010, at 39.61%. Slovenia had the lowest overall gender pay gap in 2010, at 0.95%. •	Romania’s gender pay gap has improved by 3% from 2010 to 2015, while women in Slovenia were paid 7.15% less in 2015 than they were 5 years previously.